While I didn't watch Oprah very often, I did LOVE her favorite things shows. I really love hearing about new and innovative products. Redbook magazine has a section that lists new and inexpensive items (50 things under $50) that I really enjoy reading. The last time I did a segment on "things I love" I loved reading your comments and emails about your favorite things so I've decided to make this a monthly edition...the exciting part is that I have some great items lined up to show you and what is even better is that you are going to get the chance to win some of them! I first read about Think Thin bars on GOOP (Gwyneth's Blog that I adore). 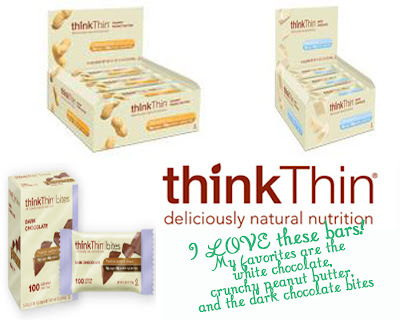 Think Thin bars are amazing! You can use them as a meal or a snack. They have NO preservatives, are gluten free, taste great, and are very reasonably priced (1.99 a bar or $1.69 when in a box). The flavors (10!) are so decadent and rich, you really think you are eating a candy bar and I like that they are so dense and filling. They have 15-20 grams of protein, no grams of sugar, and taste great. They have a similar texture to a slim-fast bar without the chemical, artificial taste. The bites are a really nice snack (I had the dark chocolate) and are a great 100 calorie snack that are also sugar free, gluten free, preservative free, and are honestly delicious and filling. 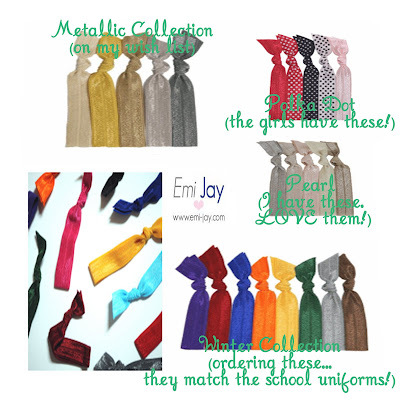 I was given one lone Emi Jay band from a friend who wanted me to try them (she had ordered a multi pack and was kind enough to share). I must have worn that hairband everyday for the first three or four weeks after I got it. Caroline borrowed it (without asking) for a Barbie doll and it was never seen again (by me anyway). When I went to order some, I read the story about how these bands came to be and about the two teenage girls who came up with the idea, needless to say it is a very sweet company. This great company with an amazing product donates its proceeds to five awesome charities; operation smile, project knapsack, locks of love, toys for tots, partners in health/Haiti. The ponytail holders don't leave a crease in your hair, they strongly hold the ponytail in place, they don't "pull" (which often gives me a headache when I wear a ponytail), and they are cute! I love them...and had to hide the new ones that arrived from Barbie! My sweet friend Chris knows I LOVE cookbooks and bought me this one a couple weeks ago (she used to eat at the Foster's Market Cafe in Durham). 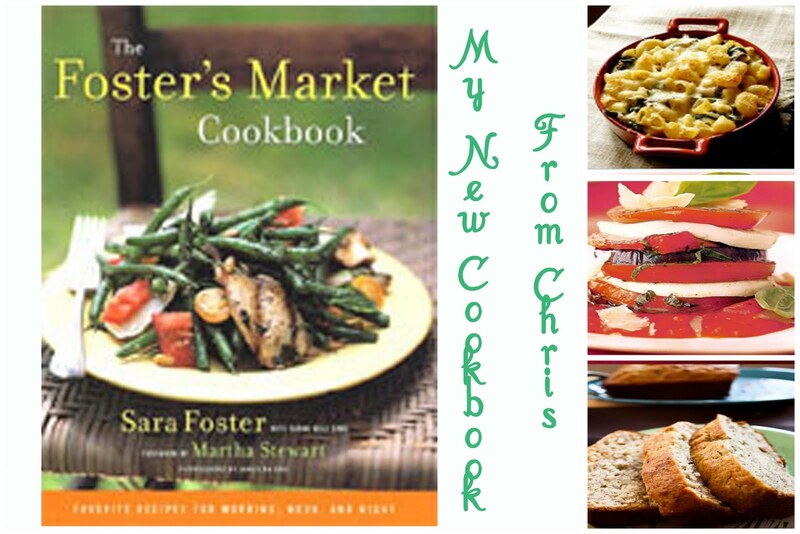 I would rather read a new cookbook than a regular book or magazine. And while I don't want my friends to buy me gifts (although I do love to buy them), I cherish this book. Every page has either a beautiful recipe or photograph or both. I have heard amazing things about Foster's (you know Sara Foster worked for Martha? THE Martha?) scones and look forward to trying them. I made their sugar cookies (the Letter "A" cookies). I've really enjoyed reading this book page by page over and over. Definitely one of my favorite cookbooks and a real keeper...just like Chris. If you read a lot of blogs, especially those that have great pictures or talk a lot about photography, you've probably seen camera straps...but you've never seen ones this cute, this inexpensive, or this soft! I have one and LOVE LOVE LOVE it! The hardest part of ordering from Virginia of Pickleberry Lane will be choosing which one to get. Usually after a few minutes of wearing my camera around my neck I am usually ready to take it off (it rubs), but the minky dot fabric that she uses makes it soft and cushy. Guess what? You can win one! Yes, you (you are a follower of this blog, aren't you?)! Go to her store and look around. "Like" her on facebook. Leave me a comment telling me which one you want. I'll let you know next week (August 5th) if you are a winner. Kristy of Aposhtrophe is an accessory designer who makes the CUTEST headbands and clips made out of leather and flowers. I have her roundabout headband (see below) and when Caroline let's me wear it (it's pink after all) I love that I can wear it all day and it doesn't pinch behind the ears or give me a headache. It also keeps my bangs mostly out of the way and stays in place; it doesn't slide. She has almost every color you could want as well as neutrals and metallics (I am drooling over the gold flowers!). Do you like my headband? Do YOU want one (you can share with your girls, one size fits you both)...any follower of this blog is eligible. "Like" her on Facebook to enter for a chance to win a roundabout headband of your very own (you can choose the colors you want). Just leave me a comment letting me know! So, just to recap, we have a one big giveaway here (an awesome camera strap and a super cute headband). Become a follower, Go "Like" them, and leave me a comment to enter! Winner posted next week, fingers crossed for you! YAY already a follower and love, love the camera straps. 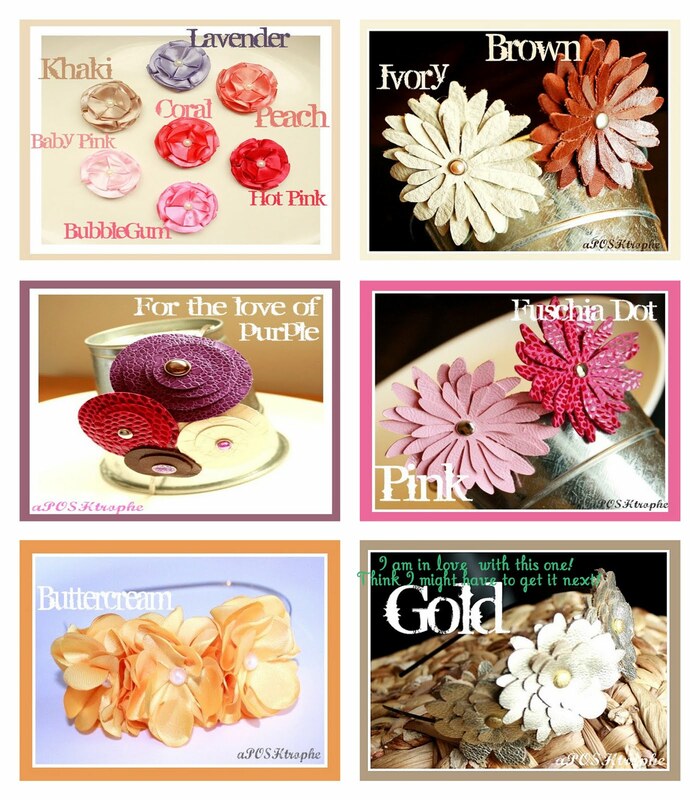 Just liked her on FB and my fave is the multicolored circle one with pink! I like the triple pink flower headband...liked her on FB too! All of the camera straps are adorable! I would totally sport one of these :) Awesome Contest K! I am a follower- LOVE the camera straps! I don't know if I can choose a favorite! Also, I liked APOSHtrophe on FB. I love headbands, and I love that you said this one doesn't pinch behind the ears. Angela, that makes me SUPER happy! yay! I "liked" Pickleberry Lane on FB. Her stuff is too cute. Love them all but my favorite is the Black and White Diamond Eye with Black Minky Camera Strap Cover. Love your "Favorite Things Post"! Super cute camera straps. Great post!! Headbands AND camera straps?? Only my two favorite things ever!!! Strap -- I love the colored circles w/ bright green strap!! Liking them on FB now! Liking Kristy on FB now too!! Love her headbands! I'm a new follower, and I just liked her on Facebook. 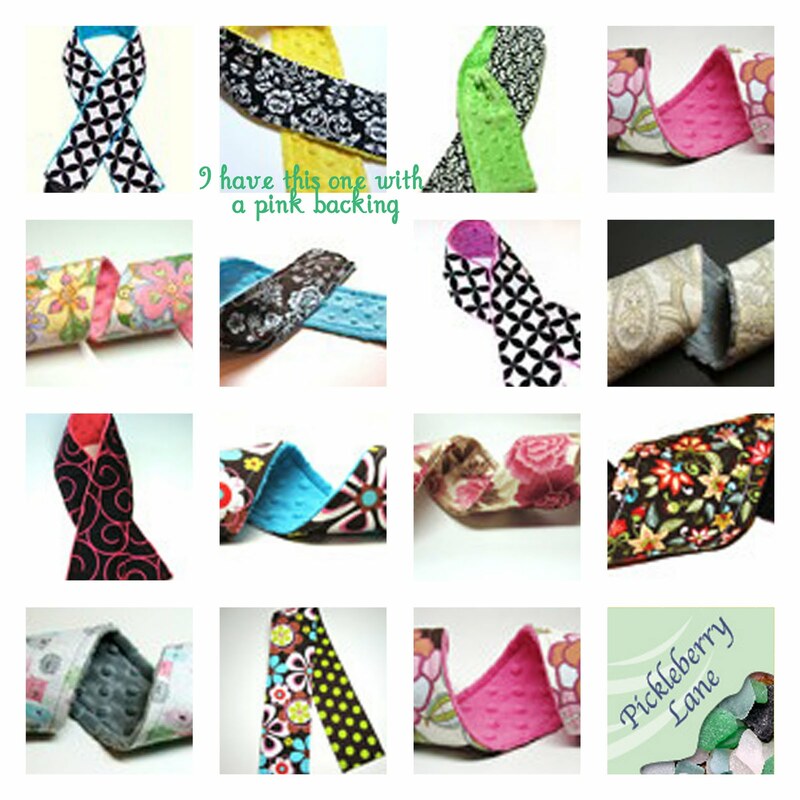 Those headbands are adorable, and I'm always looking for ones that won't pinch my head.